Yoga is all about awareness: of our inner world but also of the outside world. Yoga is about connecting with nature and being aware, not only of the single sensations and feelings of our body, but also of our interaction with the planet. A yoga session invites you to breathe the outside air in, to let it circulate into your body so that the breathing can heal the tense muscles and alleviate the mind. It’s important during such an exercise of concentration and of relaxation that your clothes are never in the way but are supporting you in movements without you even feeling their presence. In a recent episode of the Business of Fashion podcast, Dr. Tom Waller, who runs Lululemon’s research and development arm, Whitespace, explains how important the way clothing FEELS is to our mindset. He underlines that two things define us behaviorally as a species: clothing and fire. Clothing was, from the very beginning, something to protect us, and later on also became a medium to communicate something about ourselves and the projection we want to give to the world. Here we have chosen four brands that were able to match the “protective” feeling of their clothing with amazing style and sustainable materials like our ECONYL® regenerated nylon. What are the pieces in your collection that you suggest for yoga? How should the right yoga-wear make you FEEL? Comfortable and supported with flexibility and movement in the fabric and seams. What is important in the design of yoga wear? The type of fabric used and how it can support our physicality and movement eg. does it offer compression, is it shape retentive, etc. And in thinking about different poses — will the cut of the gear move well with our fluid movements. Yes, though I’ve just had a baby, so am slowly building back strength and recovering post-partum through mums & bubs Pilates and yoga classes! How important is the idea of a community/tribe in sports and for your brand? It’s the cornerstone of our business, as Salt Gypsy began life as my personal blog and wanting to connect with other like-minded female surfers. Listening to feedback from our global customer base and community is an integral part of developing our product line and tweaking our cuts & fits. Where do you take inspiration from for your clothing? Collaboration with talented women combined with street fashion and catwalk highlights. Also, I have a degree in sculpture so I’m constantly thinking about the intersection of light/water/landscape and installing objects (the female form) in those intersections. What motivates you toward sustainable fashion? It’s a business imperative — the fashion industry and our appetite for consumption has to change. We only have one planet, and I wholeheartedly believe in the possibility of a circular economy. I can’t wait for the day when our business can offer a take-back program to our customers for Lycra gear at the end of its lifecycle which can then be used to recreate new products. INDIGO LUNA — Loviisa, co-founder. Eco-conscious yoga and swimwear for women who care about the environment and want to wear ethically made, super comfortable, beautiful clothes during their practice, on or off the mat. One of my favorite quotes about yoga is ‘Yoga is not about trying hard, it’s about trying easy’. The same goes when choosing what to wear for yoga. As long as it does not distract you from your practice and you feel like you are making a positive impact by choosing them, then you have found the right yoga wear. When one puts a pair of leggings on, they should give the person the freedom to flow and feel completely comfortable with themselves. You might have heard about Yamas and Niyamas before. The ten ethical guidelines of yoga. The first Yama is called Ahmisa, which means non-harming. When designing clothes to wear to yoga, it is my number one priority to make sure making a garment doesn’t cause any avoidable harm to anyone involved in the process. It’s important to think about this when choosing fabrics, the shapes, the environment for people who sew the pieces together, how they should be marketed — all the way to shipping bags. I find it so important to look at the big picture to make sure the clothes for yoga are made by following this Yama. I practice yoga daily. It’s an amazing way to stay connected and balanced and I value the time I have on my mat a lot. I have my own self-practice almost every day and go to a few led classes every week. However, yoga is not just about the physical practice. I see it as a way to stay connected to the relationship I have with myself, others and the whole world. Honestly, everyone can benefit from a little yoga, even if it is taking a moment to listen to your breath. We take inspiration from the Earth as well as different cultures. The first thing we do when in a process of making new items is to find the right fabric that aligns with our values. When we first started designing leggings we wanted to make an environmentally conscious range and we found out about ECONYL®. This yarn being made also from regenerated fishing nets has given us the chance to make our visions true of making eco-conscious yoga wear that is closing the gap of plastic production. It makes me really sad when consumers are too fixated on how cheap a product is and does not think about the process that got it onto the clothing rack. If the clothing is cheap, then there must some hidden costs somewhere, usually at the expense of the workers who made them or an expense to the environment. There are always real people behind the making a garment and we find motivation when we can show people how fashion can be done ethically. There is always a choice and it is very motivating to be a part of the movement supporting towards ethical and every time someone wants to make the positive change. GIRLFRIEND COLLECTIVE — Ellie Dinh, co-founder. For conscious consumers who value the quality and impact behind a piece, how it was made, who made it, and what it stands for. Do you have a specific collection for yoga? While we don’t have a yoga-specific collection, all of our activewear is designed for low to high-impact workouts, including yoga. Our recycled nylon (ECONYL®) has 4-way stretch fabric that was made for moving, bending and sweating in, so you aren’t limited in your workout routine. How should the right yoga-wear or activewear make you FEEL. No matter how adorable a legging and bra set may be, I truly believe you should feel 100% comfortable in what you’re wearing, both functionally and aesthetically. What is important in the design of yoga/active wear? For us as a brand, it’s about creating pieces that function at every level of activity, that also don’t feel like you’re wearing body armor or chainmail. And to echo what I said previously, it’s so important to feel comfortable. Activewear is like a second skin, and you want to feel good in your own skin! Everything! There’s something special that happens when people band together to collectively sweat (and occasionally suffer) in solidarity. 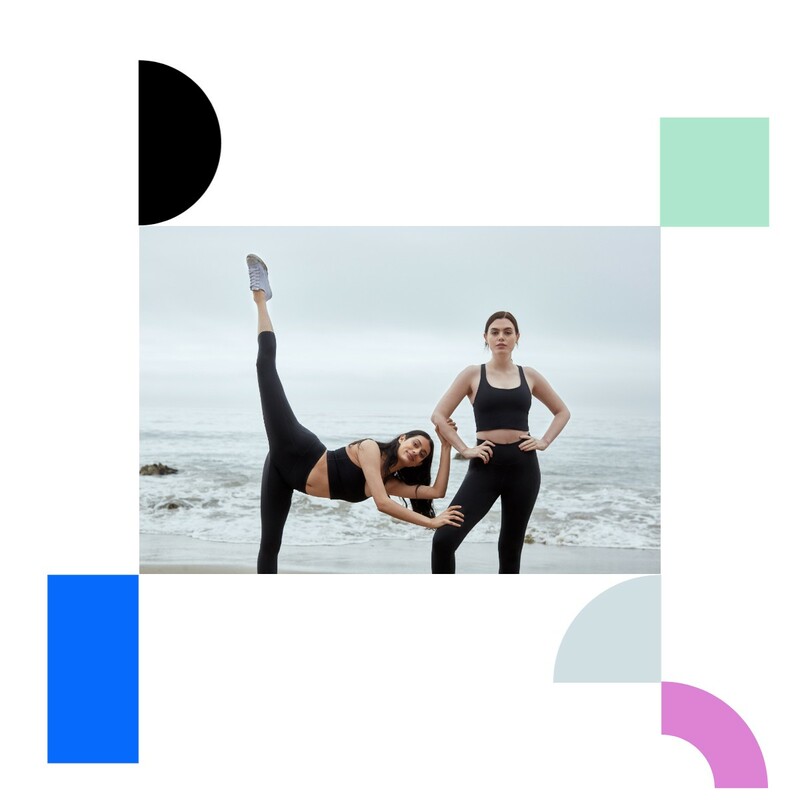 Supporting each other in our individual quests for health and wellness — in all it’s different forms — is what initially sparked the concept for Girlfriend Collective. Although, I feel like the importance of community goes beyond just being active together; both our team and our customers care about the impact of the clothing they buy. There would be zero progress towards ethical and sustainable fashion if people weren’t collectively demanding it, which they are! For us as a brand, that’s even more important. We’re a very small team of five ladies and one dude, so all the inspiration for our silhouettes comes from everyone collectively wear-testing and critiquing every single product we pitch to make sure they not only function across various body types, but remain timeless as far as their design. I’m also a huge fan of brands like Paloma Wool and Mansur Gavriel and the beautiful colorways they use, and have definitely been inspired by them for our line. Quang and I knew we wanted to create a line that was eco-friendly, but the more we really dug in and researched how wasteful the manufacturing process for nylon and polyester is, we realized we needed to be accountable at every step. We both felt we had a responsibility to work towards a solution, not add to the problem. There was, and is, so much plastic waste in the world — sitting in landfills, floating in our oceans — and we saw an opportunity to make a small but meaningful dent in this industry by repurposing it. Girlfriend collective found a solution to these problems with our regenerated yarn. ECONYL® is a recycled nylon that comes from waste instead of oil. Among the waste used in the process are fishing nets, old carpets and plastic components. Using ECONYL® regenerated nylon and also recycled polyester from recovered water bottles, the brand just launched the Girlfriend LITE collection. 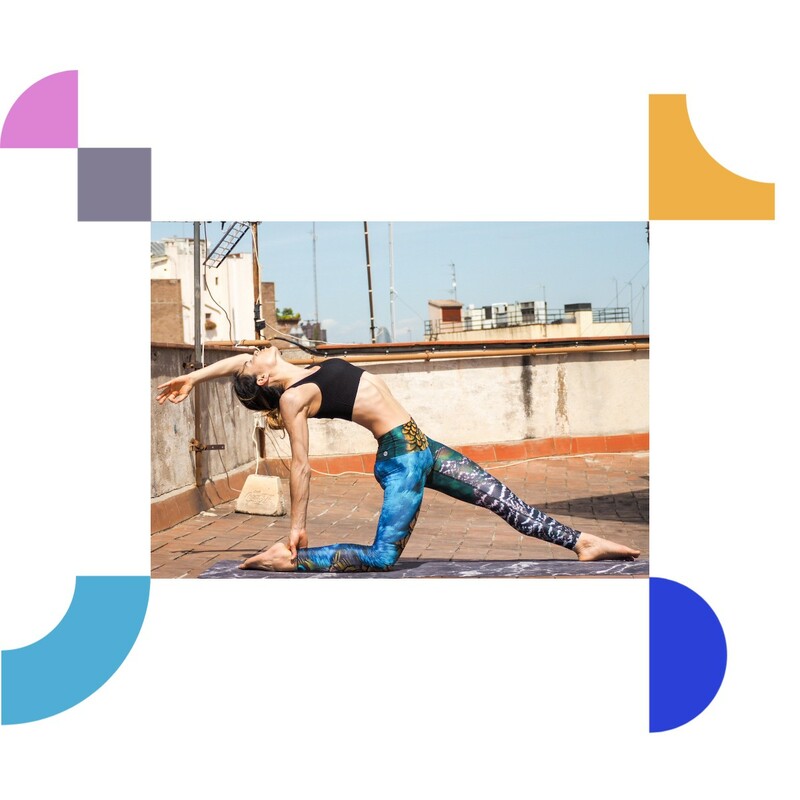 The new range includes leggings made with ECONYL® regenerated nylon with a lighter, more flexible, next-to-nothing feel that absorbs sweat and allows it to dissipate as you move, so your skin stays dry for activities like hot yoga, hiking in the desert, or relaxing fire-side. The bras, instead, are made from approximately 11 recycled water bottles. For what kind of women, you are designing for? ARCTIC FLAMINGO — Inkeri Glova, founder & designer. We at Arctic Flamingo think the right yoga wear should make you feel you are capable of anything — Meaning that you get some extra super power from our leggings which are well made and developed with your yoga practice in mind. Secondly, wearing Arctic Flamingo leggings feels like someone really cared about the world and the environment while making the right yoga leggings for you. You´ll also know that you´re not the only one who cares about the environment and for a more sustainable future, and it inspires you to continue doing eco-conscious choices in our everyday life. It’s important that yoga leggings give you support and cover where you need so that they maximize your comfort and let you move freely as a flamingo. We think a high waist is a must. We think that yoga leggings need to be opaque. We think that according to yogic principles; the clothes must be manufactured with as less harm to environment or people as possible. This is why we are manufacturing in Germany where we also are based, we are using only local suppliers, we minimize the transport and waste and use only recycled materials always when possible! And it almost always IS possible! Sure, I practice yoga! That is also how it all started; from my own yoga practice and interest in sewing and designing my own unique and outstanding yoga leggings, which are also a great conversation starter, by the way! How important is the idea of a community/tribe for your brand? We at Arctic Flamingo want you to carry a message of eco-consciousness wherever you go. Wearing our leggings is a statement: a way of empowering yourself and others to care about the world. Seeing fellow yogis to wear our yoga leggings, proves you there are also plenty of other people making eco-conscious choices and supporting eco-friendly lifestyle, and it inspires and encourages you to make more sustainable choices in everything you do. Originally from Finland, it is only natural that I seek inspiration in the nature of the Arctic: in Finland, people traditionally have a close relationship with nature. These Nordic roots represent stillness, harmony, stability and being at one with nature. Arctic Flamingo combines them with bold, colorful tropical birds that embody freedom and a lust for life. For me, these two opposites tell a story about two complementary pairs in the same way as sky and earth, cold and warmth, being grounded and uplifted. The most beautiful and unexpected color combinations are designed by nature, and it can surprise you endlessly! Having two small kids is a great motivation to manifest more sustainable consumption. I feel so badly about the global warming and mass consumption that I feel I need to do SOMETHING for better future of our planet. 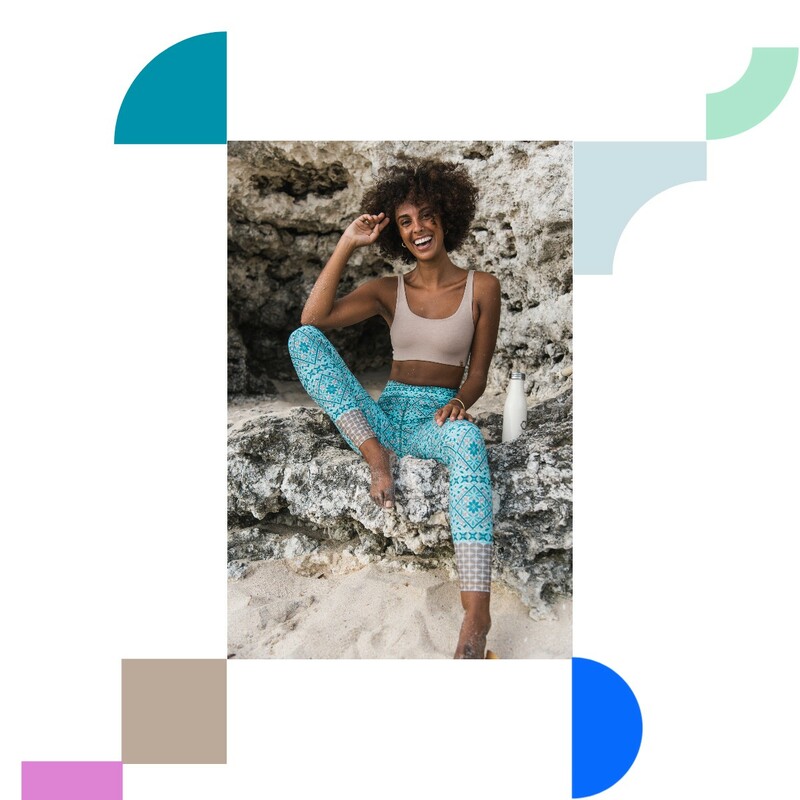 It means, not only producing more eco-friendly yoga leggings and supporting other eco-responsible businesses, but also empowering and inspiring people to buy less and to buy from sustainable brands and to make more conscious choices in all aspects of life. We are proud of supporting and sharing the story of these four brands we are working with and that are using our ECONYL® regenerated nylon in their collection. You can find out more about our yarn on our website and social media and discover why ECONYL® is a virgin quality yarn with a different story: turning waste problems into exceptional fashion and interior solutions.